Sometimes I dream about ice cream. I know that sounds crazy, but since I became aware that I am lactose intolerant, I stopped eating ice cream about 20 years ago. It has been difficult. When I dream of ice cream, I am always in the Catskills. It is summertime. I am standing on the side of the road by our dock and the Good Humor man comes by, and I get my favorite treat, a chocolate sundae. I am in ice cream heaven. For years the same ice cream man came by my grandparents’ bungalow colony. Since it was situated right on West Shore Road, we would run up to the gate when we heard that ding-a-ling bell. There would be the big white Good Humor truck. Sometimes we were at our dock across the street. One of the Moms always had money to treat us. It seemed he came every day at the same time. Ice cream treats were always the best. But it was not just the Good Humor man who made us happy. When we moved up the hill to the new property my grandparents purchase, it had both a winter home and a bungalow, we were very close to Fink’s Kauneonga Park Bungalow Colony. There was a small grocery store on the property, and sometimes my Mom would send us there to pick up milk or some other essential. She almost always gave us money for ice cream as well. I loved looking down into the freezer to chose a treat. I liked the cone with vanilla ice cream covered in hard chocolate and nuts. Oh Yum! We often got an ice cream treat at the Casino/Clubhouse at the White Lake Home Estates when we went to play bingo. And another favorite ice cream stop was Newman’s. There was an ice cream fountain there, and you could order a sundae, or perhaps a milk shake with two straws, or maybe a banana split, or a malted. Newman’s was extremely yum. The year we came up to the Catskills, and it was closed, we were devastated! When we got older we often went to Poppy’s in Parksville. That was excitement. Usually a group of us drove there after a movie. The weirdest is that we once ran into our parents there having ice cream. We never saw them there again. I think they started going somewhere else. It was embarrassing to be out with a group in our late teens/early 20s and have our parents there. But I think they were embarrassed as well. They could not let go with their young adult children watching. Lonely me sitting in the car watching everyone else in line to get Candy Cone! But the best of the best in Kauneonga Lake and White Lake is and was and always will be Candy Cone. Sitting close to the intersection of 17 B and Route 55, near to what was the Ritz Theater and across the street from El Monaco’s, Candy Cone is a Catskills dream come true. 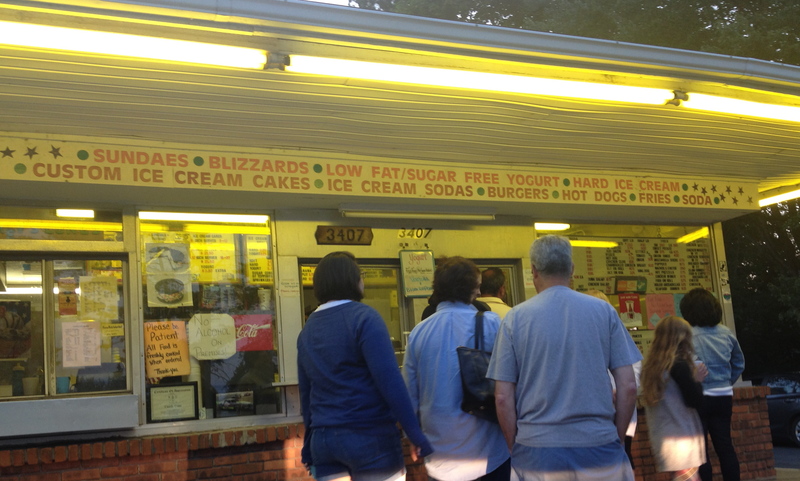 To this day, a trip to the Catskills is not complete without a stop at Candy Cone. On the weekends my Dad would drive us up for a treat. There were so many cars waiting for people to buy soft serve ice cream. Sometimes we would get big containers to take back to the bungalow. But really the best was buying the cone you liked. I always wanted vanilla soft serve with chocolate topping. I loved how it froze and became solid on the ice cream. My Mom’s favorite was chocolate ice cream with sprinkles. Everyone had a special. During the week, and before we could drive, we often walked the two or so miles to Candy Cone. I will say my friend and I got in the biggest trouble on the way back from Candy Cone once. I honestly do not think he would ever do that, because my Dad yelled, but that usually calmed him down. My friend appreciated that he never said anything to our Moms. “Your Dad was cool,” she recently told me. “We could have been in really big trouble.” Which is true. If our Moms knew that we tried to hitch a ride, we would have been grounded, as we knew that hitching was forbidden. Candy Cone is such a big part of our lives, that even though I cannot eat it, I still go. There is something special about sitting in the car watching everyone eating an ice cream. It brings back so many memories with our parents. In the back of Candy Cone there is a large deck to sit on. When you walk that is the best place to sit. I have been there many times with friends and cousins. This past summer my brother, sister, nieces and I were up there. We went one time with my brother. And I thought we were done. But as we left on Sunday afternoon, and we were supposed to be on a rush to get home because my niece had to see someone, we stopped at Candy Cone. And how could I let my sister break a promise to her daughter. So we had to stop. They enjoyed every bit of their cones! There was something special about eating ice cream in the Catskills. It is no surprise that I still dream about it: that cool enjoyment of a swirl of ice cream in my mouth. Oh, how I dream about ice cream in the summertime! Purchase LACTAID in the supermarket. When one is lactose intolerent, one can take a couple of caplets prior to eating ice cream. I have been doing that for many years. Unfortunately not me. Mine is more of an allergy along with it. Poppy’s had the best toppings and colored whipped cream. I miss those days. Thanks for the memories. I had forgotten about the colored whipped cream!